ARE YOU TRAINING HARD BUT LOOKING FOR MORE? Legion has been featured in some pretty neat places. Get access to our best 6 week accessory program that includes all kinds of things not trained in a typical workout of the day . Finding out what really works is hard. And it's easy to feel overwhelmed with conflicting information. Training can sometimes feel like throwing a bunch of random tactics at a wall and seeing what sticks. Pick a workout from this blog or that blog, do some exercises with a band around your knees you saw on Instagram, and foam roll that one "tight" body part into oblivion. One of the most challenging parts of training is filtering through the sea of information available to you and knowing that you’re on the path to your goals. It’s easy to get lost endlessly browsing blogs, forums, and YouTube not knowing whether each screaming headline is an important nugget of tactical information or just another quick fix aimed at shaking a quick buck out of the lowest common denominator of people looking for results without the hard work. For athletes looking to compete, there’s a constant anxiety surrounding social media and endless comparisons to the performance of others. "What squat program are they following? How come they seem to hit PRs every other week? It must be that weird banded kettlebell exercise they do. Or they're just on drugs. Definitely must be drugs." For the person who wants to be competitive but isn't sure where to start, there's a mish-mash of options out there - but it's mostly training programs written for the best of the best. Looking at the training of the best athletes in our sport is a case study in survivorship bias. Rather than -- "doing this program will make you good." It's more like -- "If you're already really good, you will be able to do this program and come out the other side uninjured and better than when you started." For everyone else, it's overtraining, burn out, achey joints, and tendinosis. After writing thousands of training programs, we've started to learn what works and what doesn't. We've made plenty of mistakes and we've seen some astonishing successes. And, most importantly, we've worked consistently with athletes to see what works and what doesn't. "Here's our proven training system. We take you through a uniquely-crafted battery of tests to assess your strengths and weaknesses. 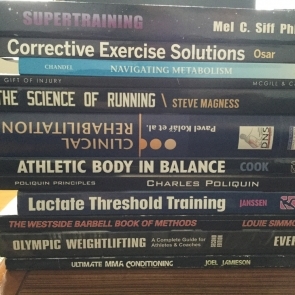 Then, based upon that, we recommend a specific focus in your training - and, through utilizing the most up-to-date methods of energy systems training as well as best practices from weightlifting, bodybuliding, powerlifting and rehabilitation work - we rebuild your performance from the ground up while accentuating your strengths and attacking your weaknesses." Sometimes it does work that way. And other times it doesn't. You see, training in fitness is a sloppy, messy, and chaotic environment. What we can offer is a complex decision tree of priorities, contingencies, and psychological frameworks. And, if you apply some of those frameworks on your journey, you might just find that you get where you want to go a bit more quickly. Other times it looks like snagging a spot at the CrossFit Games® after just missing in the Master's qualifier the previous year (although jumping an age bracket probably didn't hurt). Or it can mean earning an individual spot at Regionals after spending some time hanging out on "the bubble." If you want to see some of our training programs that our athletes have followed to finally make it to Regionals or the CrossFit Games®, just enter your e-mail address below and we will send those templates over.